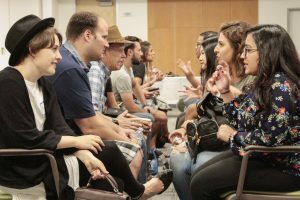 This year, we are creating some great opportunities for you to meet your fellow certificate students & recent alumni and make important connections! Register for our free class, FILM TV UL 700 Free Networking Opportunities for Entertainment Studies Certificate Students. In addition to serving as your RSVP for our networking events, registering for this free course will give you access via Canvas to continue networking with your peers online after the event. To register for our networking events, click here. Join us for our quarterly networking activity where you will have the opportunity to connect with students in various Entertainment Studies and Screenwriting certificate programs! Pay by space parking is available in Lot 36, behind Extension Gayley Center. FORMAT: This FREE event features Round Table Networking, a fun, face-to-face activity where you will have the opportunity to connect with students in various certificate programs. After the round table networking activity, students will be able to mingle and continue building on connections made during the round table networking activity. Please arrive on time as the organized networking activity will begin promptly at 5pm. Attendees should come prepared with an elevator pitch regarding projects you are working on or how you could contribute to a project, as well as business cards, headshots, one-sheets, resumes, demo CDs, DVDs or flash drives, and any other materials that you want to pass out!